If you do not currently have access to Mtivity DAM and would like to inquire into how this module could improve your workflow, please contact Support. When selecting a file to upload to Mtivity DAM, you will select files to upload and then be greeted with this screen. 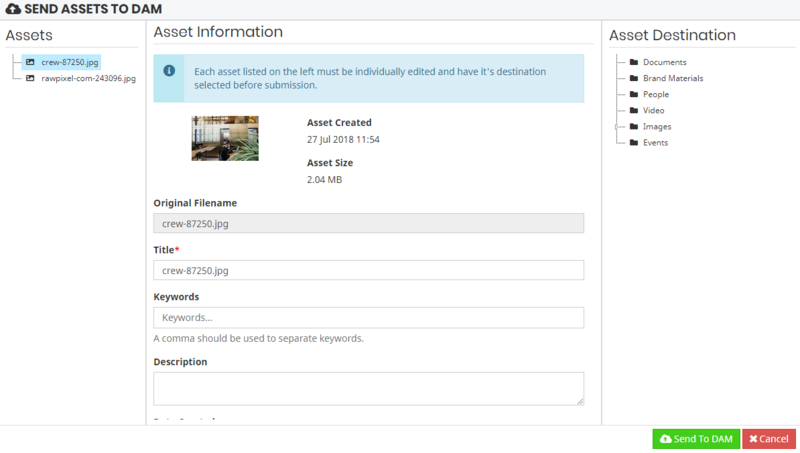 This will give you options to assign information to each individual file before upload. It will allow you to assign a name, file keywords, file description, Mtivity job name & number. You will be able to do so for each individual file as listed on the left and must assign each file to the intended folder on the right. 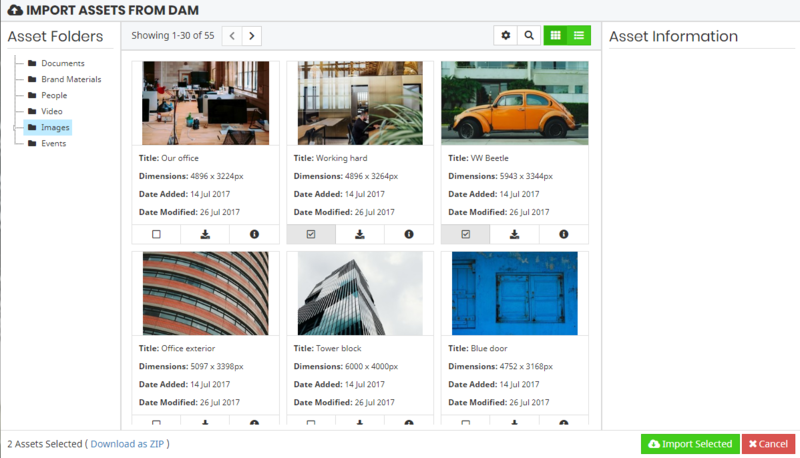 Once you have finished making your edits, simply click Send To DAM and the files will be uploaded. If you would like to make edits to folders, you can simply right click on the folder on the right-hand side and choose to either add an additional one or delete the one selected. When choosing to import from DAM, you will be presented with this interface. 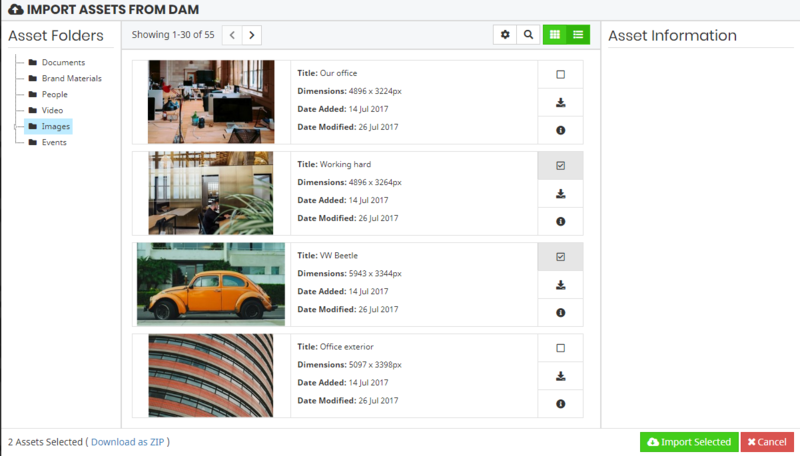 From here, you can easily see at a glance the thumbnails for your files, a way to download them, select for importing and a button to see further information about each file. In addition, upon selecting files, you will see an option in the bottom left-hand corner to download the selected files directly as a ZIP file. This may take a short while to complete as the system needs to create the file before sending it. By pushing the button in the top right that looks like a grid or lines, you are able to switch between a grid of thumbnails or a list of files for faster navigation. You can see more in-depth information on each file by clicking the i button. This will initially show some basic information in the right-hand panel and give you an option to click to see more information. This additional information includes various basic statistics around the file as well as more in-depth information such as DPI, Colour Mode & Colour Depth. This will also show you any Description and Keywords you've assigned to this file. Finally, by pushing the the search button at the top, you will be able to see a set of advanced search options. 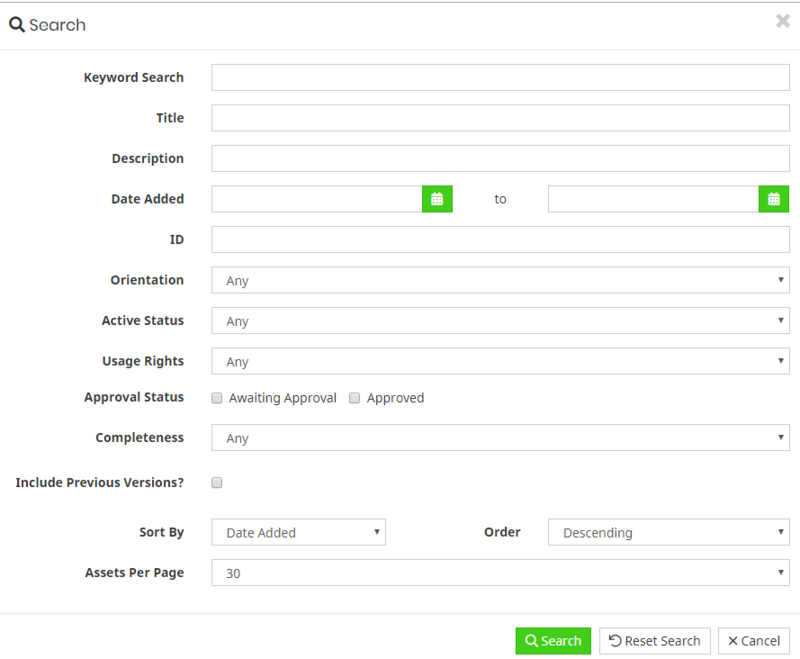 This will allow you to search by Keywords which are metadata you can store against your files, filter by asset types or for the file creation date along with a multitude of different options to find the exact file you wish to download. 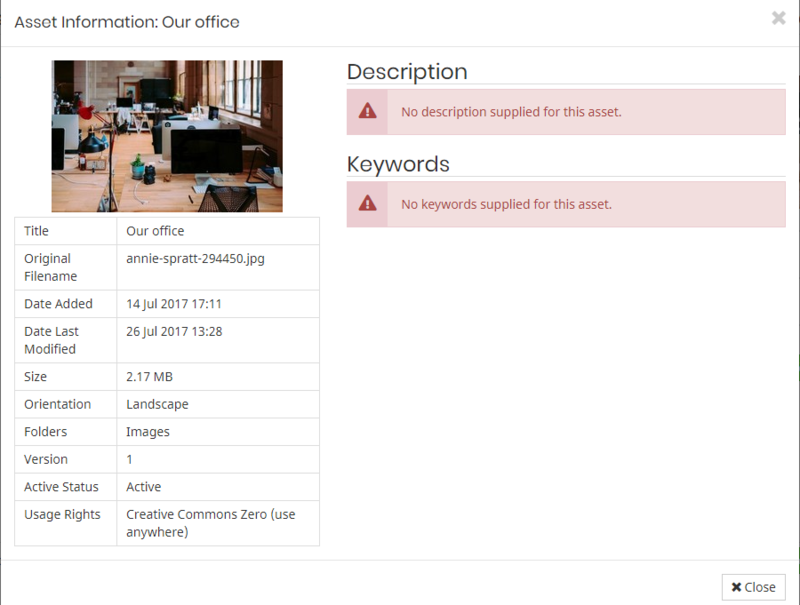 Once you have made your selection, click the Import Assets button, and after the short loading screen shown above, your files will be available in your system to use.